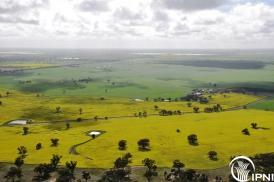 This project will address these increasing concerns and speculation in a three pronged approach for all six micronutrients named in the tender (Mn, Zn, Cu, B, Mo, Fe) for all cropping regions in Australia except for those in WA. This project will liaise closely with a separate bid being prepared by Dr Ross Brennan of DAFWA to address issues in WA specifically, should that bid be successful. This project will produce clear guidelines for management of micronutrient disorders for the major crops in the southern and northern regions of GRDC based on existing knowledge which has been objectively tested for its relevance to modern cropping systems and modernised for current technologies and economic circumstances where necessary. Between 2014 and 2017, a series of field experiments were undertaken to assess the effect on crop yield of multiple rates and application strategies of micronutrient fertilizers in soils deficient in the target micronutrients (copper, zinc, manganese, boron, and molybdenum). A total of 22 experiments were conducted in South Australia, Victoria, southeastern Queensland, and southern New South Wales. The results have been reported on the IPNI ANZ research project website http://research. ipni. During 2016, another group of ten micronutrient field experiments were undertaken across southeastern Australia predominantly on wheat. There were three copper (Cu) trials, two zinc (Zn) trials, one boron (B) trial, and three manganese (Mn) trials. An additional trial with Cu applied to field beans was abandoned due to excessively wet conditions. 2014 was the first field year of the GRDC-supported micronutrient project. The objective of this research is to review and revise the Zn, Mn, and Cu management guidelines that were developed in the 1970s. This review is necessary because of the profound changes to cultivation systems, crop N and P nutrition, higher yields, and more intense and diverse rotations. As a consequence of a scoping study undertaken by IPNI in 2013, the Grains Research and Development Corporation (GRDC) commissioned a national program to investigate the current gaps in knowledge of micronutrient (i. e. , B, Cu, Fe, Mn, Mo, Zn) management for grain crops. Current micronutrient management packages were developed from research undertaken 20 to 40 years ago in a vastly different farming system.